Hiya guys! Unfortunately I have a bit of bummer news to share, this is one of my last posts with my newly acquired squares. Yup, it happened again. I managed to break it at an angle during the weekend as I cleaned the counters. And this is why I don't clean, haha. Not a huge deal as I have become accustom to my round nubs, but still a bummer nonetheless. Thankfully though I'm going out with a bang as my last swatch was from one of my favorite indie brands. 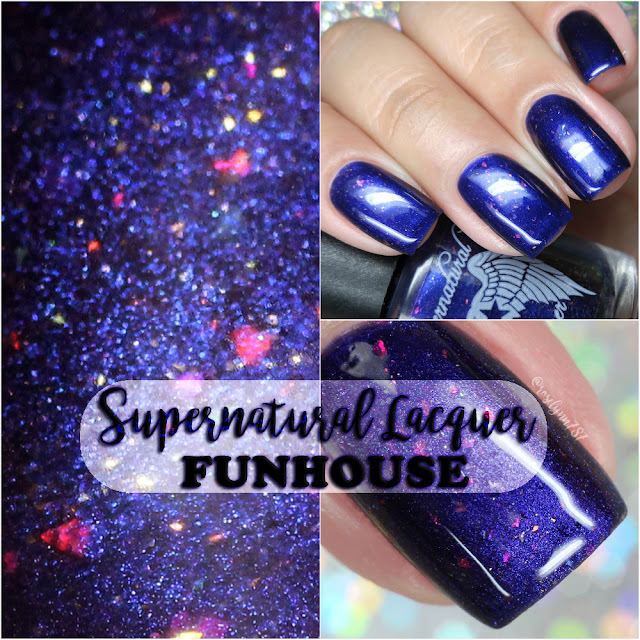 Today I'm sharing swatches for Funhouse by Supernatural Lacquer, which is part of week 6 in the Road to Polish Con series. That's right Supernatural Lacquer will be a vendor at the Fall Polish Con happening in Chicago. I wish I was going to the event. but alas it's not in the cards for me this time around. That's alright, I plan on living vividly through my friends, haha. Enough babbling, let's get to the swatches! Funhouse by Supernatural Lacquer is available for purchase August 6th thru August 12th only as part of week 6 of the Road to Polish Con. Each full-size shade retails for $10 and can be purchased at www.thepolishconvention.com. Funhouse can be described as a purple jelly with a purple/blue/red/gold shift and hot pink/orange/gold flakies. The formula has a nice application with a good amount of opacity for a jelly. Consistency leans on thin, which works nicely in the natural placement of the flakies. There is no clumping and it builds up evenly. It ends up drying to a minimal gritty finish that smooths out after topcoat. Shown here in two coats and sealed with a glossy topcoat. Overall this is another winning shade from Stefanie and Supernatural Lacquer. I love everything from the name to the color of the base to the electric colored flakies. The formula is actually my favorite part about this shade. I wasn't expecting a thin consistency to have such a perfectly smooth application, but it does and it works amazingly. There is a reason why I adore this brand and purchase frequently from her. And if you haven't experienced it for yourself yet, then this is your chance! I feel like I'm gushing, but seriously ten out of ten would recommend LOL. To recap, Funhouse by Supernatural Lacquer is available for purchase August 6th thru August 12th only as part of week 6 of the Road to Polish Con. Each full-size shade retails for $10 and can be purchased at www.thepolishconvention.com.